Whether your diesel generator is your primary source of power or used as a back-up energy source, good maintenance practices will increase the life of your equipment. For smaller portable home generators this process is relatively simple and should be done prior to storm season. Check the belts look for signs of wear; dry or cracking belts can be the cause of inefficiency in your generators performance, replace them as necessary to prevent overheating the motor. If your generator requires antifreeze; drain it and replace with new product at the beginning of hurricane season. Old fluids can lead to corrosion of the radiator. When in doubt – review your Owner’s Manuel for the maintenance schedule. With a little preventative care – you can greatly increase your generators lifespan! documented, logging any actions taken and readings for future comparison. These schedules are provided by the manufacturer and can be performed in-house by your engineer or can be provided through a contract with an electrical contractor or the Manufacturers distributor. The best way to extend the life of your generator is through preventive maintenance. Air Intake System – If your system has a turbocharger – replace Air Cleaner Filter elements as recommended by the Manufacturer, Inspection should include the charge-air cooler for any detritus which can damage or block the fins. The schedule for cleaning this system is determined by the operation schedule of the generator. Fuel System – Inspected during operation, all lines, and filters should be checked for any splits or thinning. Adjust any lines that show slight signs of wear due to abrasion to prevent eventual breaking. Repair any leaking lines immediately. Diesel fuel should be drained periodically as recommended by the manufacturer. Water can accumulate as it condenses in the tank. A fuel conditioning product such as Petrolabs Diesel Power, http://www.petrolabs.net/dieselEN.htmare available to increase fuel lubricity and disperse water while acting as a corrosion inhibitor & fuel stabilizer. These can be added to the fuel system after draining & prior to fueling to increase the storage life of the diesel. Exhaust System – Inspected during operation, the entire system must be tested for connection problems, any leaks must be detected and repaired. Engine – Check all fluid levels – Oil level is checked after engine is cooled down, allow at least 10 minutes for the oil in the engine to drain to the crankcase. 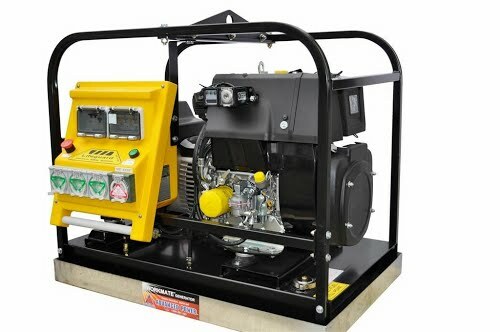 Refer to the specifications provided by the Manufacturer for appropriate Oil requirements to maintain warranty and increase generator lifespan. Level should be close to full mark – Protect our Earth – Always dispose of used Oil & Filters properly! Coolant Systems – Check level on cool engine. If level is low add to approximately three-quarter inch below the cap lower seal. To protect your warranty always use the product the Manufacturer recommends, following all mixing and additive requirements. Standby Generators are required to operate from a cold start in an emergency – which can cause harsh burdens to engine parts. Regular use can improve the life of an engine by maintaining lubrication prohibiting oxidation of electrical contacts, and prevents fuel issues by lessening the storage time. Generators should be cycled at a minimum of 30 minutes on a monthly basis at full load if allowable. This test should be done with records noting any performance issues with appropriate measures taken to correct any problems. With a little TLC your generator can provide years of service!